These fracture patterns offer clues to global changes of shape that the satellite has undergone over time, possibly in response to tidal forces exerted by Saturn or as a result of changes in the internal structure of the icy moon. Some of the most prominent global patterns of fracture are delineated in color in the southern hemisphere map shown here. This map is being released along with a northern polar projection map (See PIA07721 ). This map is a polar stereographic projection that was mosaicked from the best-available Cassini and Voyager clear-filter images. The map is centered on the south pole and coverage extends to the equator. Gridlines show latitude and longitude in 30-degree increments. The same maps are available without colored fracture lines (see PIA07719 and PIA07720 ). 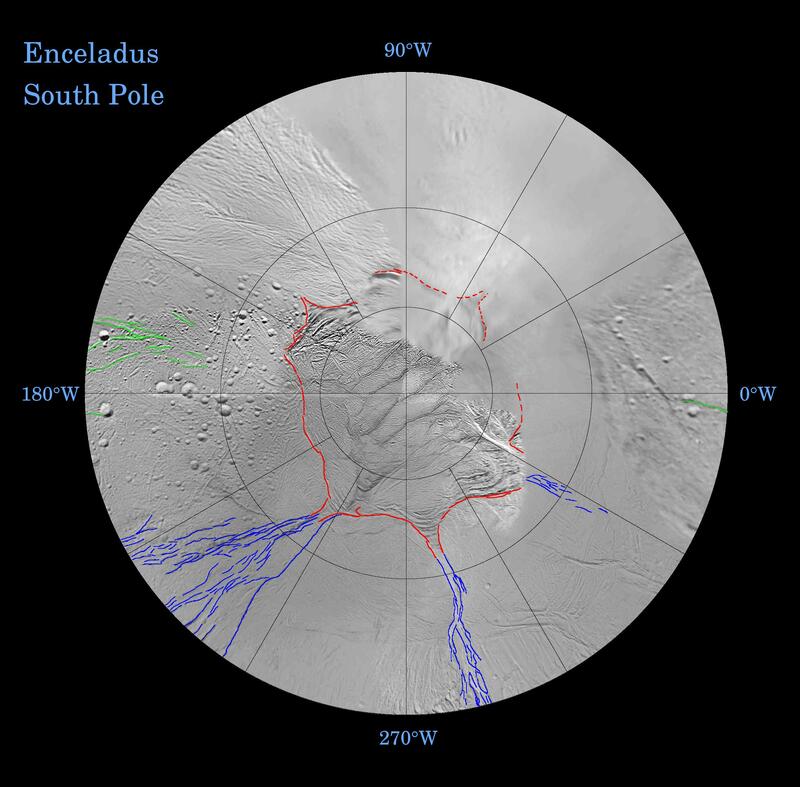 Terrain near the north pole ( PIA07721 ) is among the most heavily cratered and oldest on the surface of Enceladus. The conspicuously fractured southern polar region is nearly devoid of impact craters, making this terrain among the youngest on the moon's surface.